"Knygnešys" ("The Book carrier") by Juozas Zikaras, 1939. The sculpture stands in front the Vytautas the Great Museum in Kaunas. The two swimmers carefully pushed their water-proof wrapped bundles onto the sloping riverbank and slipped silently out of the water. Shaking themselves like dogs to rid their bodies of as much water as possible, they hurriedly donned the clothes that were secured to the top of the bundles. For some time before darkness fell they had lain hidden on the opposite riverbank, timing the frequency of any border guard patrols and choosing a landing area on the other side. Although the river was not particularly wide at this point, the current was reasonably strong and rather than fight it they planned to allow the current to aid them in a diagonal crossing. Dressed, they hoisted the packs by the rope harness, adjusted them on their backs, and set off for the pre-arranged rendezvous with their colleagues. They had some ten kilometers to cover during the short hours of summer darkness, avoiding any military patrols enroute. The year was 1899, the country was Lithuania, the river was the Šešupe, which at that point was the border between East Prussia and Lithuania, before it merged with the Nemunas, Lithuania’s largest river, which then became the border. The two swimmers were my father, Vincentas (Vincas) Stepšis, and my uncle Juozas, both of whom were smugglers— in the literal sense of the word— as the bundles they carried, according to the occupying Imperial Russian authorities, contained illegal material. However, the contraband they carried across the frontier of the two countries was not to evade revenue payable on taxable commodities, nor were they doing so for personal gain or profit. 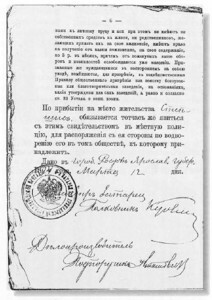 They were risking their lives, incarceration, or banishment to the frozen wastes of Siberia for nothing more than Lithuanian language literature—books, journals, newspapers— which would be secretly disseminated to their fellow countrymen; the hazardous task voluntarily undertaken without any thought of gain or glory. But why was it necessary to bring their own-language literature into the country covertly and at the risk of life and limb? Why would ordinary countryfolk— peasants— at best only semi-literate undertake such risky, dangerous missions for the sake of printed paper? Why, indeed, had this to be done clandestinely and why was apprehension by the Russian authority so severely punished? To comprehend the why and the wherefore thousands of people like Vincas and Juozas Stepšis gladly did this task, despite the consequent hazards, it is necessary to understand something of the troubled history of the ancient land of Lithuania. The only extant photograph of Vincas Stepšis (a.k.a. 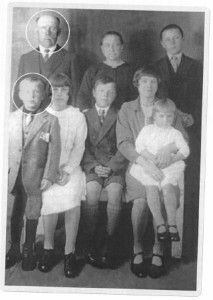 William Millar — rear), taken in 1930 in Scotland, with his family. Next to him are his wife Petronėlė (formerly Domeikienė) and Joseph Domeika. The author (aged 7) is in the front row, accompanied by sister Mary (on knee), half-sisters Alice and Ann, and half brother Peter. An underground movement began printing the forbidden literature in their native tongue across the border in East Prussia. 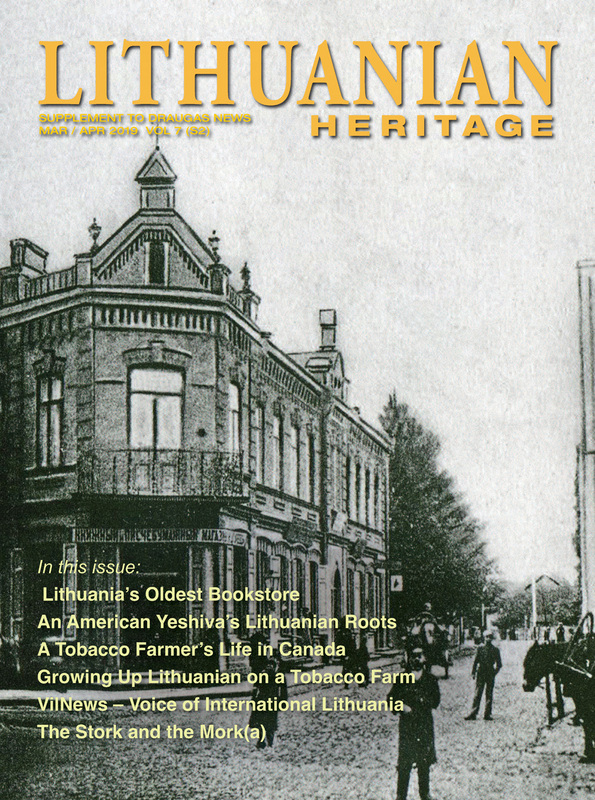 Originally inspired by the clergy, particularly Bishop Motiejus Valancius whose rallying call was “Visada ir visur buk lietuvis” (“Always and everywhere be Lithuanian”) and who exhorted everyone to discard the Russian books and keep teaching the old Lithuanian language, even if in secret. In answer to his call, men who were themselves unable to read or write, ferried the packages of books across the border and distributed the contents. And so the knygnešiai (book-carriers) came into being. The womenfolk taught the children at their knee during the performance of the daily domestic chores. Both Tsar Alexander and Muravyov completely underestimated the nationalism, resilience, and stubbornness of the Lithuanian people. The more repressive the measures they inflicted, the greater grew the resistance. On that night in 1899, my father and my uncle Juozas delivered their bundles to the distribution center in the village of Pilviškiai before dawn and spent the daylight hours resting and sleeping at the house of a friend and fellow “smuggler.” As darkness fell that evening, they made preparations to return to the Sakalupio area; having said their farewells they set off. About two kilometers or so from their hideaway, a figure loomed up in the gloom in front of them and the voice of the local policeman said: “Ah! Vincai, Juozai, I would not go home tonight.” Not another word was said or needed. The brothers understood, the military were waiting for them. Turning their footsteps toward the Šešupe river, they swam across to the East Prussian bank intending to lie low with their book-smuggling colleagues until the authorities gave up the search for them. Four weeks later word reached the brothers that they were still being vigorously sought after, the hue and cry had not diminished as they had hoped. After some soulsearching they decided it would be disastrous to return to Lithuania for some foreseeable time with incarceration or Siberia as the only future facing them. The only choice was to bid farewell to their native land, their usefulness as covert book-carriers gone, and head west— to the land of opportunity and freedom, the United States of America. Service of Vincentas Stepšis (1894). Working their way across Prussia and Germany to the port of Hamburg they found they had insufficient funds for the fare to America. Almost exactly twelve months from their encounter with the friendly policeman, the boat they were on docked at the Port of Leith, Scotland. Vincas Stepšis was born on the 9th of July 1870, his brother Juozas two years later, at Sakalupio Dvaras (estate), near the town of Kudirkos Naumiestis, Lithuania, about two kilometers from the banks of the Šešupe river, to Tadas Stepšis and his wife Petronele Barzdai-tyte Stepšiene. His father Tadas (my grandfather) died when Vincas was 4 years old and my grandmother Petronele died shortly before Vincas reached his 10th birthday. Orphaned in childhood, the two boys worked from that early age on the Sakalupio estate where their father had been coachman to the dvarininkas (estate owner). On reaching the age of 21, Vincas was conscripted for military service in the Imperial Russian Army on 12th November 1891, and posted to the 6th Battery, 3rd Brigade Grenadiers Artillery on 10th December 1891, far away from his homeland, in the Ukraine. Two and a half years later he was lying in a bed of a military hospital in Rostov with a fractured skull where a horse had kicked him about an inch above his right eye. 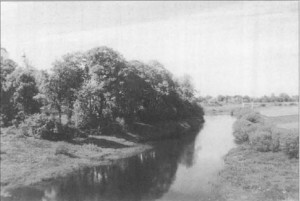 The Šešupė River, near Kudirkos Naumiestis. On returning home after making a complete recovery from his dreadful injury (which the Russian Commission had thought highly unlikely), Vincas found that his brother had not complied with his call-up to the Russian Army but had joined the local “underground” as a covert book-carrier. W ithin a week Vincas and Juozas were a twoman unit in the team of smugglers. As border dwellers from birth, they were familiar with the whole area and knew all the nooks and crannies from their boyhood adventures. For the next five years the brothers carried out their book-carrying exploits, miraculously avoiding apprehension by the occupying authorities, until the night in 1899, when they were, fortunately, warned allowing them to evade certain capture. Some of the banned books “smuggled” into Lithuania from East Prussia by the knygnešiai. There were occasions as a child when the tales I heard seemed so fantastic to me living in Scotland that I thought they were fictional stories, like fairy tales told to satisfy a youngster’s demand for a bedtime story. 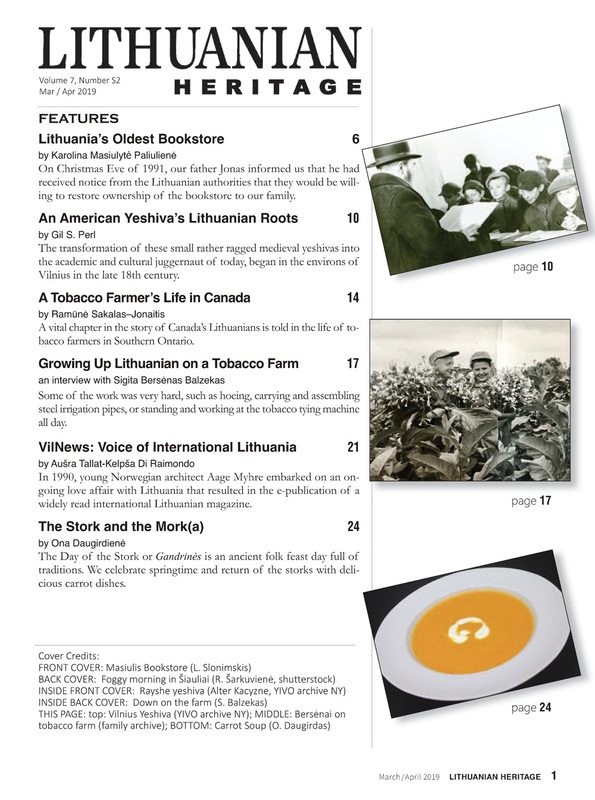 Not until I visited Lithuania for the first time in 1993, when I was welcomed as the son of a knygnešys, did I fully realize just how understated my father’s stories really were. 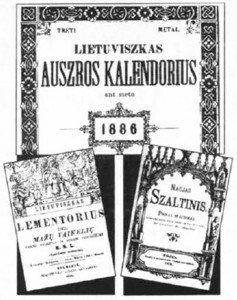 I still have a memento of my father’s book-carrying days— my mother’s prayer book-titled “Szaltinis” (“The Wellspring”)— it has been confirmed as one of the “illegal” publications by the Lithuanian National Archives, probably published between 1894 and 1899. 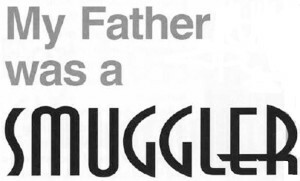 In any other country a smuggler as an ancestor would probably be cause for embarrassment but, as the son of a Lithuanian “smuggler” of the 19th century, I have no sense of shame or embarrassment. 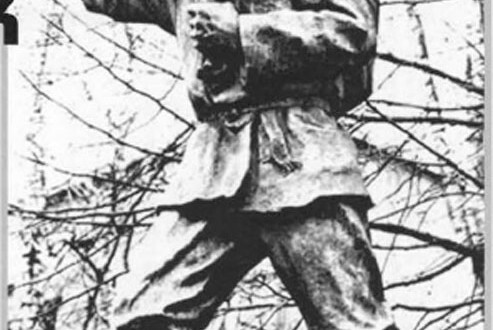 The very opposite, for I have a heartstirring pride that my immediate ancestor was one of the warriors described by Father Kasperavicius and had been a hero— however minor— of his country and his, and his many colleagues’ exploits are part of the folklore of his native land.